Needle felting is one of those simple crafts that I love to pull out from time to time. These needle felted acorns were the first needle felting project I did on my own and I am always so happy when I unpack the ‘fall' box and spy these little guys. 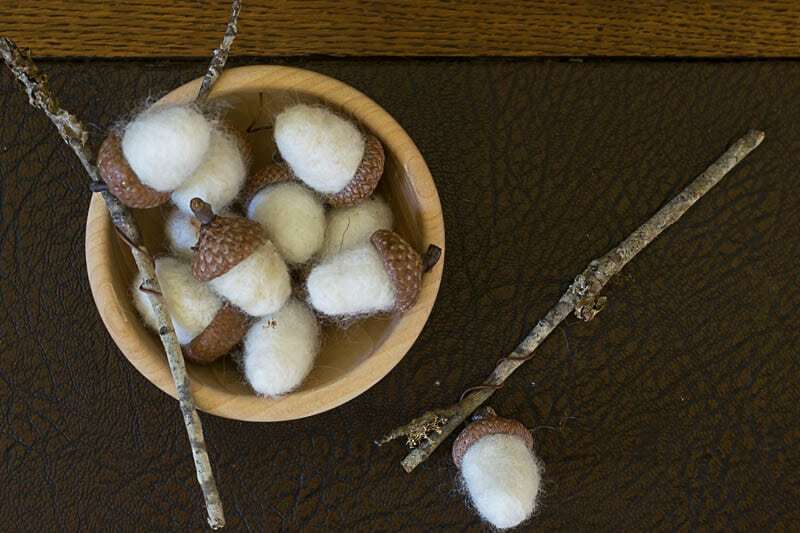 They are a great fall adornment in a bowl on their own, wired to a branch or as lovely needle felted acorn napkin rings for a fall table. This post was first published several years ago, but I have recently updated it. Wool Merino Roving. I've easily made 30 acorns from this 20 gram bag and still have some left. A little goes a long way. I also had some brown left over from the making of Rudolf, and I incorporated some brown into a few of the acorns for some variations. Felting Needles. These are the kind I used, you really only need the 38 for these acorns. If I do more felting, I may get one of these as the needles can get hard to hold onto after a while, especially for my mile-long fingers. Felting Pad. No way around this, those needles are sharp and you need something to absorb the point. Acorn Caps. My sweet sister-in-law and her family collected some for me in the mountains of NC, but I also purchase some bigger ones online. Etsy has some here. Brown Florist Wire,if wrapping the acorns onto a branch or for the napkin rings. Brown Rustic Wire 70′ 18 Gauge, if making napkins ‘rings' from the acorns. 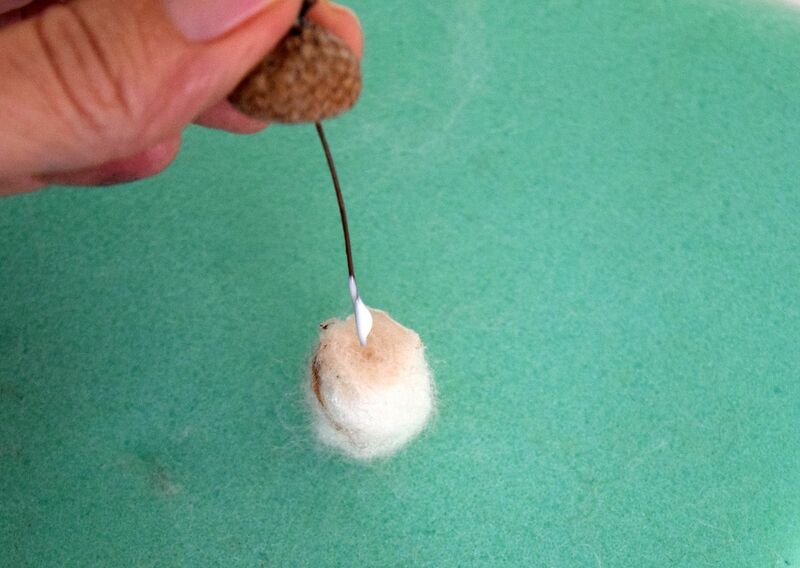 If you are going to want to wire the needle felted acorns on to a branch or for the Needle Felted Acorn Napkin Rings, drill holes in your acorn caps, as close to the stem end as possible and set them aside. Cut your florist wire into 3-4 inch segments and set them aside. Gently pull some fibers out of your wad of wool. You can't really rip it off, it's best to just pull the fibers out. You don't need much and its best to start too small than too big. You won't be able to really reduce the size once you start felting it. The process of felting compacts the fibers. 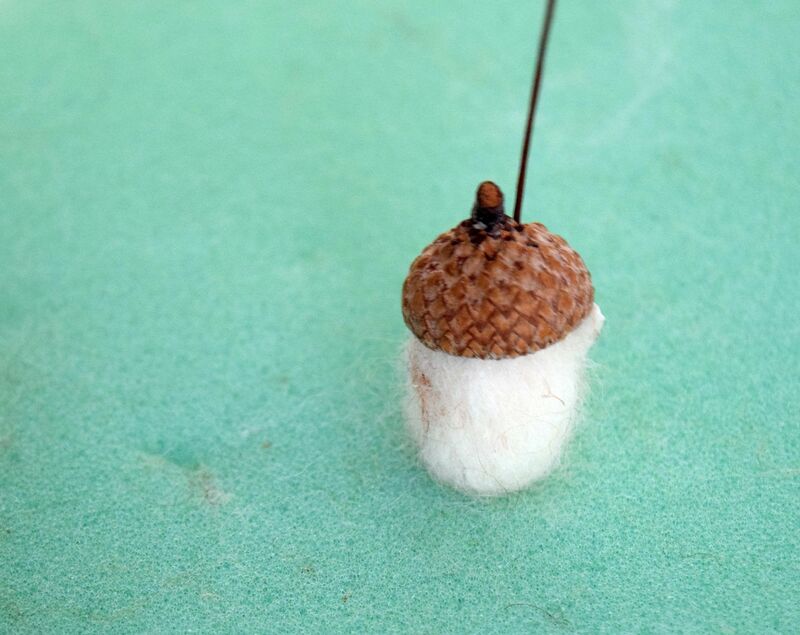 The beginning of my little GIF below gives you a sense of how much wool you need for one needle felted acorn. Two things to remember when figuring out the amount of wool you need…I have really long fingers so your proportions will be different and I actually made this one a tad too big. Start poking it with your needle. The felting needles have little ridges which catch the fibers and compact them. Regular needles will not work. Watch your fingers!!! After making these needle felted acorns, I purchased leather finger guards…worth their weight in gold! 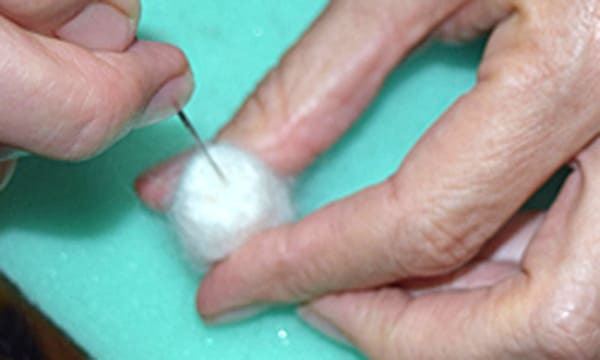 You can start out holding two needles to make the beginning process go quicker. The first 50 or so pokes should be all over, just really to compact the fibers. Once you've got them compacted a a bit, you can start shaping. I made my acorn flat on top and rounded on the bottom. That just required me to hold the acorn with the top side up and poke down, shaping it as I went. You'll do the same thing on the bottom, just not making it so flat. You'll go around the sides of the bottom, pushing in the fibers as opposed to primarily coming down from the top. You'll notice as you go along, the needle will start getting a little resistance. That will be the fibers compacting. Start to finish, each needle felted acorn takes about 5-7 minutes. 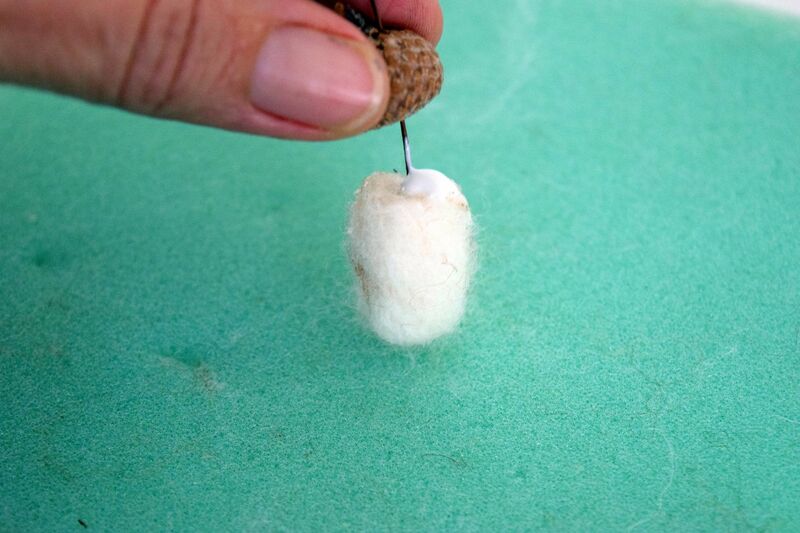 Once you have the needle felted acorns the size you want it, if you want to attach wire to the acorns then take your felting needle and make a hole in the top by going in and out of the same hole several times, while at the same time pushing the needle against the hole to widen it. Go down about 3/4 of the way through you acorn…don't go out the bottom. Put a dab of glue on one end of your florist wire and jam it into the hole you made. 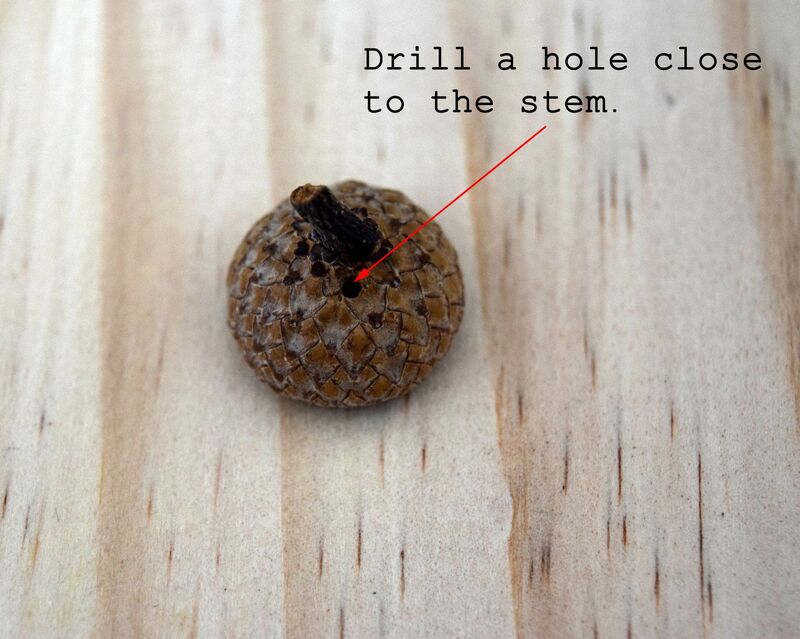 Drop the acorn cap over the other end of the wire and secure the cap to the acorn with a dab of glue. For my Needle Felted Acorn Napkin Rings, I made 3 wired acorns for each ring. 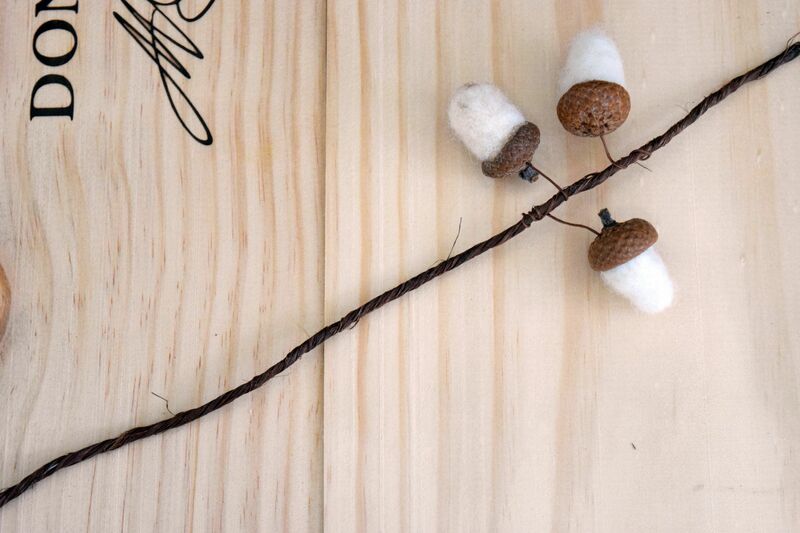 Once you have your stash of wired acorns, it's time to attach them to your rustic wire. I cut my wire about 1 foot long and added a dab of clear drying glue to each end to prevent the fiber from unraveling. When I wrapped the Needle Felted Acorn Napkin Rings around the napkin, I arranged the acorns so they were all laying flat. 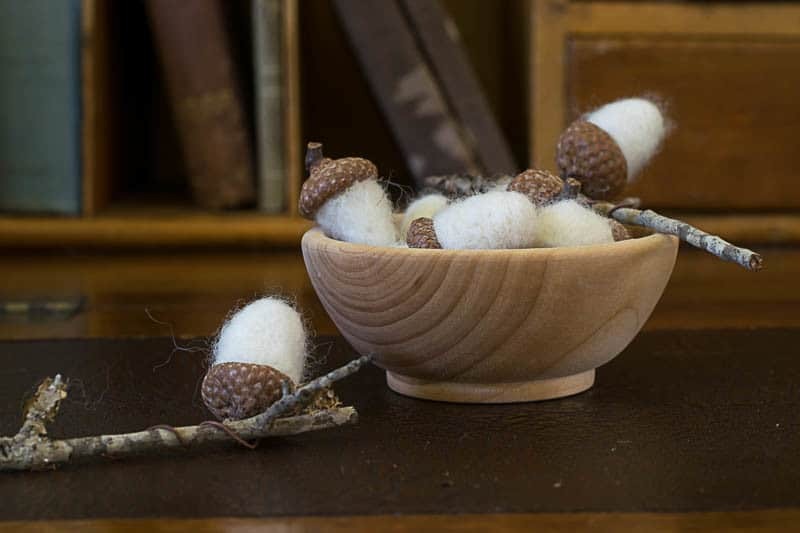 So that's that…needle felted acorns to fill a bowl or Needle Felted Acorn Napkin Rings for your fall or Thanksgiving table. You can see how I fringed my linen tablecloth and napkins here. Bookmark this page or pin the following image if you'd like to refer back to this Needle Felted Acorns or Needle Felted Acorn Napkin Rings project at a later date. These are darling! I love that you turned them into napkin rings – what a cute idea! Stopping by from the Something To Talk About party. Hi Emily, thanks for your kind words. I do love my acorn napkin rings…they work great on my table. Thanks for stopping by. They are so perfect for the season! Thanks for sharing at our Creative Spark party—I’m featuring these this week. I hope you’ll stop by to link up again and grab a “Featured” button. The party starts at 6am EST tomorrow 🙂 Have a wonderful week! Thanks Emily, I’m giddy about being featured this week and I’ll be back to party again tomorrow. Really appreciate the work you put in being a co-host! Lynn? Oh my! I really love these, and you did such a fine job – both in the end result and in your tutorial. Thanks for sharing! Oh my, this is such a pretty and CUTE DIY!! I love how detailed you made the tutorial!! Awesome! Found you through #WAYWOW! I’d love to have you come over and link your post up to my craft party which starts at 7pm EST. and is new every Thursday! I also pin every post! Hi Denise. Thanks for your kind words. And for the invitation. I’d love to join your party! I’ll see you tomorrow. They are absolutely beautiful! Such detail and I really like the way you can use them as napkin rings. They could go anywhere and would look great & natural! These are so very pretty. And your tutorial was very detailed and helpful. I will have to go looking for some acorns, and if I find them I will definitely give it a try. They add such a warm and elegant touch to the tablescape. Thanks so much Mary. Surely there are acorns in the Boondocks!!! And Congratulations on your Blogger Award! I love how you made these acorn napkin rings!! Very creative!! Perfect for a fall table setting. Thanks so much Keri. I’m pretty tickled with them. Hi Sarah! Oh I’m so excited that you love them. They are sweet aren’t they!!! Have fun felting!!! These are so pretty! I am so amazed at the things that can be made from needle felting. Like your pretty acorns, miniature animals etc. if I didn’t already have enough hobbies going on I would give felting a try. Thanks Linda…I get you about Hobby overload! Got to know when to say when, which is hard to do sometimes. Enjoy your other hobbies and thanks for stopping by. So beautiful! Perfect for January tablescape. I don’t know why, but in January I’m all about whites.I love colors all year round, but January is my color free zone 🙂 Definitely pinning. Good morning Mila and thanks for stopping by for a visit. I’m so glad you put the January idea in my head! I become very focused in my thinking and all along just saw these as fall decor, but your comment has really made me see how pretty they’d be on an all white table, maybe with some Mercury glass!! Got to think outside of the box!!! Lynn, I was so impressed with your calligraphy placecards and am just as impressed with these lovely felted acorns. They look so cool! I never would have thought they were handmade, they are perfect, as if a machine created them. I love how you attached them to the branch and on the napkins. What a gorgeous table setting! Do you have room for one more at your holiday table? I could set and enjoy this, and I’m sure the food going on the table will be just as gorgeous! Ah Nikki, now you’re getting at my soft spot…I really do love these little acorns. And so easy to do. It’s nice when the concept actually gets carried out to fruition…these turned out just as I had imagined. Thanks again for being the hostess with the mostest! The acorns haven’t started falling here on the West Coast of Florida but now when they do I will keep some to try this darling idea. Good Morning Debra, gather those acorns! It’s a fun little craft and I hope you enjoy making them. I have wanted to try my hand at felting for some time now. These are absolutely darling! Thanks for sharing the instructions! Don’t have time this year, but hopefully next. I have a nice stash of acorns gathered over the years. Hopped over from One More Time party. Happy to be a new follower! I have a link party, Share Your Cup Thursday. It’s about sharing the things that make you happy. I’d love if you shared some time! Hi Jann, thanks for visiting today and for your kind comments on my acorns…I do love them! Hope you give them a try when time allows. One of my blog friends noted how great they’d be for a winter tablecloth after the holidays…just a thought! Thanks for the party invite…I’ll be there! Got to love anything that shares happy!! Lynn, those are so stinkin’ cute I actually aquealed out loud! Well done, ma’am! Oh Michele, thanks for your very sweet compliment. It is much appreciated. And I enjoyed browsing your site and reading about your recent luncheon and seeing your beautiful Thanksgiving setting. Can you believe it’s literally right around the corner!? 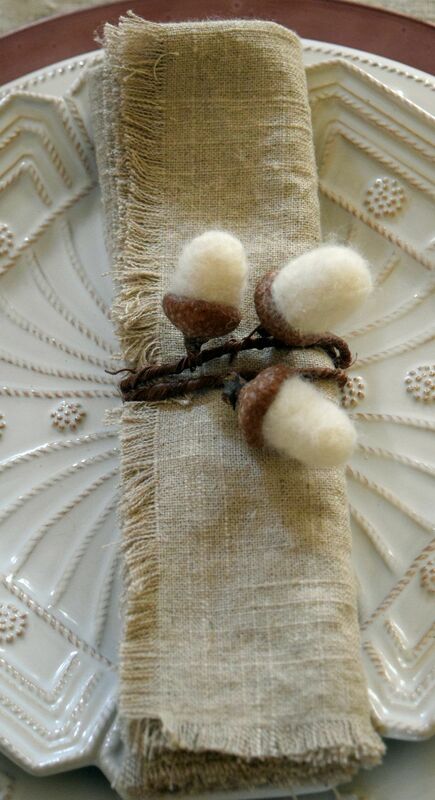 I absolutely love your felted acorn napkin rings – so pretty! Hi Marie, thanks for visiting and thanks for you kind comments. I’m pretty tickled with the acorns as well! BTW, visited your site today and really dig your wood coasters. Putting them on my to do list…it’ll be good for me to find something to do using power tools! One of my many new year resolutions is to spend more time in the garage. So glad my wood slice coasters inspired you to make some for yourself Lynn! That’s a great new years resolution – have fun in the garage. Girl Power!! Hi Lynn, I just loved these so much that I had to feature them at Share Your Cup this week. Thanks for joining! I’m so glad I found my souioltn online. Aw gee Minerva, thanks so much! You can’t have too many soulmates! And I really appreciate you being there to read what I put out and for taking the time to comment. So very much appreciated.